On Monday, 19 March, 2018, CERGE-EI hosted the presentation of the 17th EEAG report in the magnificent Schebek Palace. The European Economic Advisory Group (EEAG) reports annually on specific economic policy issues and follows its objective of offering research-based insights to the public and policymakers. This year’s report is titled “What Now, With Whom, Where To – The Future of the EU” and puts a special emphasis on macroeconomic conditions, the role of trust within Europe, and economic convergence. 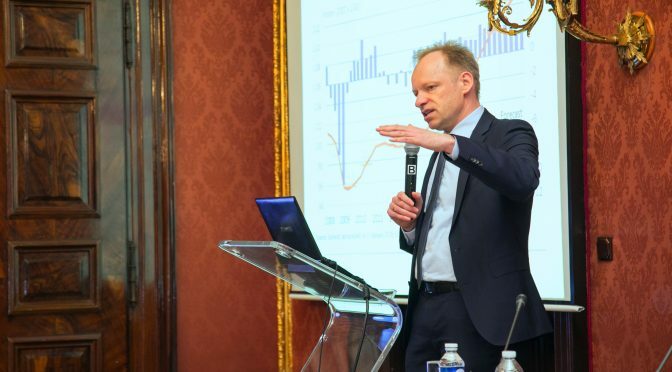 Prof. Clemens Fuest, President of the renowned Ifo Institute and one of the members of the EEAG advisory group, presented the report on the European economy in Prague, one of only six cities in Europe which had the opportunity to host this exclusive event. Furthermore, Marek Mora, member of the bank board of the Czech National Bank and Head of Budget, Tax and Regional Policy Directorate at the General Secretariat of the Council of the EU, commented on the Report, presenting not only a Czech perspective on the findings, but also sharing his distinct view. The background of the report was a paper published by the European Commission, which, in contrast to common practices, suggested five options for the future of Europe, ranging from doing less together to “we should create a European federation” with the goal to spark a debate about the future of Europe since the current model is in crisis. According to Prof. Fuest, the global economy is recovering and export-oriented countries in the EU like Germany and the Czech Republic are benefitting from this development. Nevertheless, high unemployment levels in Greece and Spain remain a major concern for the EU. Fuest also stated that we are in the middle of a cyclical boom which offers a great opportunity for economic reforms. “You can’t build a future on suspicious minds” was the introductory quote to the topic dealing with the issue of trust within Europe. It can be observed that trust is reflected in economic development and as it appears from the report, trust in the European Union is limited. According to different surveys, the underlying problems are mostly that the EU is promising too much and delivering too little. At the same time, member states have to contribute more and increase the responsibility to regulate their objectives. In this context, it should be kept in mind that trust can be both a cause of institutional weakness and a consequence of it. Not only was the issue of trust an important part of the report, but another guiding question for the future was also discussed: “Should we just be more flexible?” Is it worth a try to leave the EU the way it is and let countries that want to bond and work together in specific alliances do as they like? This is a broad outline of the Country-Club-Question, covered in the third chapter of the EEAG Report. The last topic of the report deals with economic convergence, in particular pursuing one specific objective: achieving a reduction of divergence between the levels of development of member states within the European Union. Convergence can be measured by observing the correlation between the rates of growth within a country proportionally to its initial level of income. Although the aim of the EU is to achieve output convergence, it depends on member states to put it into practice. From his viewpoint as a central banker, and with his experience working at a European institution, Marek Mora mostly agreed on the presented topics, but he also added that factors like the Chinese financial sector and uncertainties about US policy are also aspects which need to be taken into account as they have consequences for global development, and thus, also for the EU. He also agreed that we are experiencing low levels of trust due to the recent crises. Furthermore, Mora added to the question of enlargement and deepening – as, from his experience, the enlargement of the EU did not bring an increase in trust but rather a decline. After the presentation, a lively discussion rounded off the formal part of the event and the audience was cordially invited to join an informal get-together, which offered the unique chance to engage in conversation with Prof. Fuest, Marek Mora, and other prominent guests, while having a glass of champagne. The event was attended by representatives from companies and institutions such as Bloomberg, several Embassies, and the European Commission.